This room is warm with rustic hues of yesteryear. At the top of the stairs, across from the lovely appointed bath, with its claw foot tub, is the SFA room. We named it after the “Father of Texas” and Morgan and Ruby Flournoy’s alma mater. They enrolled the first day it opened its doors and later married for 65 years and raised 5 children here. It is furnished with an old wagon wheel lamp, longleaf pine hat rack, ornate heater and Ms. Ruby’s hand made rocking chair. You can go back in time as you gaze out through the old wavy glass windows. 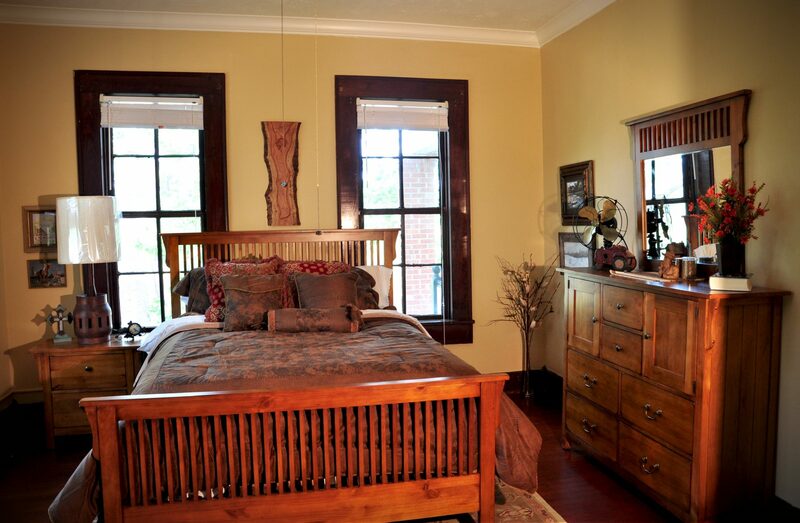 Just lay up in the Mission style queen bed until the smell of coffee and breakfast comes wafting up the stairs. Slip on a robe and come down to begin an exciting day.